In my basement, we have a rarely-used sink that—for the longest time—would produce foul smells periodically. We tried pouring powerful cleaning chemicals down it, thinking perhaps there was a blockage somewhere in the pipe. We tried adding pellets that were supposed to neutralize odors. We took the pipes apart, but didn’t find anything and ended up just reassembling it. As it turned out, the problem was more fundamental than we realized. The system of pipes looked okay and seemed to work fine, but there was a major and largely invisible design flaw that only allowed a one-way flow of air. The plumbing had been installed by the previous homeowners, who were less than meticulous in much of their DIY renovations, and they hadn’t consulted any experts before doing the work. The solution was a significant redesign, cutting out valves and rerouting pipes, which was a challenging and time-intensive puzzle—but completely worth it in the end. In our work at Center for Health Progress, we tackle a lot of complex problems, but perhaps none as challenging as health equity. The reason it’s so difficult to end health disparities is that their root causes are both seemingly invisible to many of us privileged enough to not experience them, and intractable enough that solving them will require an extensive redesign of our systems and institutions. Right now, our health care system only adequately serves a portion of our population because of the way it was designed and built. Our historical systems of power grant privilege and access unequally, meaning some Coloradans benefit while others are harmed. Over the past two years, we’ve done a lot of thinking about how to best talk about these inequities, and focus attention on their root causes: racism, classism, poverty—among others. We’ve consulted with some of Colorado’s most forward-thinking health equity leaders, and connected with Coloradans whose daily lives are impacted by health disparities. 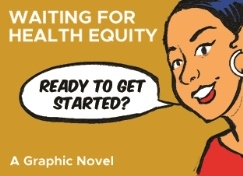 And now, we’re proud to share Waiting for Health Equity, a graphic novel highlighting these issues through stories, data, and a historical perspective. Today we’re releasing the first chapter, and we’ll release one chapter per week from now until April 5. In it, you’ll meet Damian, a high-energy kid whose asthma can’t slow him down; Claudia, an ambitious Mexican immigrant; Jake, a young veteran with high health needs; and several more characters, whose lives have brought them all to the same small waiting room, on the same day. We hope it will be a tool for launching new discussions and challenging our own perspectives and privilege. If it makes an impact on you or your work, we hope you’ll let us know, and help us determine where to take this project next. The challenges these characters face in their personal lives are a direct result of the fundamental flaws in our systems and institutions. There isn’t an easy fix, and we’ll need to call in the experts—the Coloradans affected by these root causes of health disparities—to help us design the solution. We hope you’ll be a part of that, and we hope you’ll help us share this new tool, because the first step is starting conversations so we can find common ground. Check back next week for chapter two—happy reading!